Although Harrison Weir is officially acknowledged as the "Father of the Cat Fancy" due to his key role in the establishment of cat shows, he was in fact much more. His chief claim to fame was being widely acknowledged as one of the leading illustrators of the Victorian era, especially where bird or animal life was the subject matter. In this field he held a pre-eminent position, both in Britain and around the world. He was also widely acclaimed as a naturalist and as an expert on Poultry and Pigeons. His work appeared in a large variety of periodicals and in a growing range of children's books and magazines published on both sides of the Atlantic. His exceptional artistic skills, coupled with extraordinarily keen powers of observation and a benevolent attitude towards animals, helped to educate and influence several generations of young people across the globe. It was his very natural portrayal of examples of both the generosity and sagacity of animals in real life situations, which contributed to a significant change in Victorian perceptions towards their humane treatment. By 1877, more than five million copies of his illustrations were being circulated annually. Because his interests and his illustrative subject matter was so broad, he became, in a very real sense, an artist that could and did appeal to all ages, for all ages. He was one of the foundation staff members of The Illustrated London News when it was established in 1842 and was still on the staff when this leading newspaper celebrated its Golden Jubilee in 1892, and beyond. An industrious and prolific artist, he has left an immense legacy in his paintings, drawings and countless illustrations, the majority of which stand as a testament to his philosophy that mankind must treat all animal life with respect, friendship and compassion. 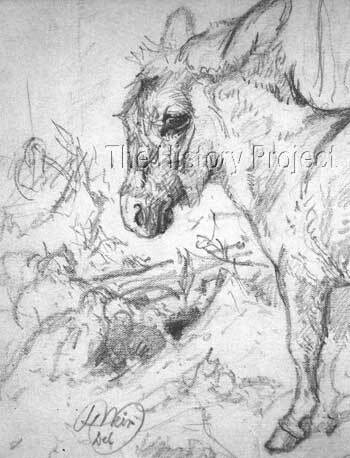 Detail: Original pencil sketch of a donkey by Harrison Weir. 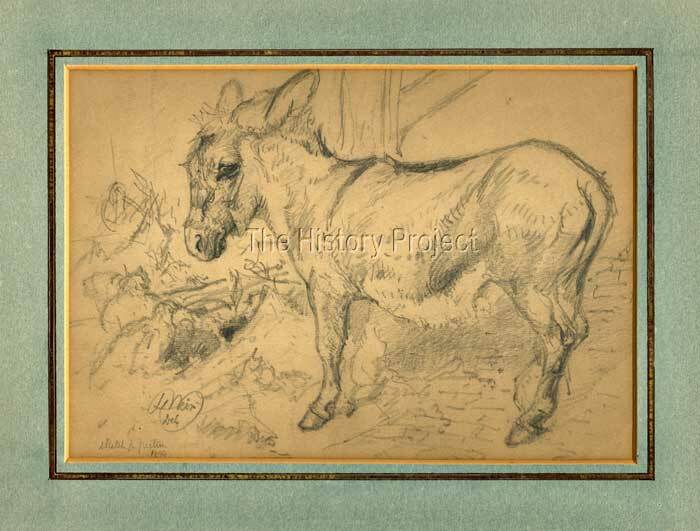 In this original pencil sketch of a donkey, we find a relaxing rural setting, with simple lines representing the presence of poultry, in front of the donkey. The drawing is also simply notated - 'Sketch for a picture', showing that it was likely a study from life, with the intention of recreating it in the studio at home, into a painting. It is signed and dated 1899, by which time the artist was living at his last residence in the hamlet of Appledore. He would have been 75 years old at the time this drawing was executed. Note how the lines are so fluid, drawn with the ease and freedom of spirit of an artist supremely confident and dexterous in his craft. Harrison Weir today, is a British listed artist, so much of his work is held in private collections around the world. Thankfully this work came to market in its framed but protected raw state and a purchase was quickly and successfully negotiated, so that it came directly into The Harrison Weir Collection.